"A wonderful, outstanding, and caring OB Doctor that put his patient first and does what is in the best interest for them." Here you will find inforamtion about new and exciting things going on at Dr. Domingo's office and the community. You will aslo find fun facts about the office and what we do to give back to the community. WELCOME Evelyn Brister, M.D.B.S., Board-Certified OB/GYN to our Staff! Graduated The University of Akron: M.S., Kent State University;M.D., Northeastern Ohio Universities College of Medicine (NEOUCOM). Obstetrics and Gynecology Residency Training: Aultman Hospital, Canton Ohio. She has served patients in our area for over twenty-years. She is a female physician that recognizes that a woman has special health concerns throughout her life. She offers compassionate, skilled medicine for Women of All Ages! Welcome Dr. Brister to our team!!! Ablert T. Domingo was recently added to Who's Who in Black Akron/Canton. Dr. Albert Domingo was inducted into the Society of St. Luke along with Dr. Farouq Ahmed, and Dr. Michael Linz on September 27, 2012 at Brookside Country Club. The Society of St. Luke was established to recognize and honor selected members of the Mercy Medical Center Medical Staff for their distinguished service to their patients, the mission of the Medical Center and the Stark County Community. St. Luke is the "Patron Saint of Physicians" as he emphasized Jesus concern for all people, especially the poor and neglected. Mercy recognizes this compassionate spirit of medicine through the Society. CONGRATULATIONS Doctors Domingo, Ahmed and Linz. for this distinguished honor. You can read Dr. Domingo's speech here. 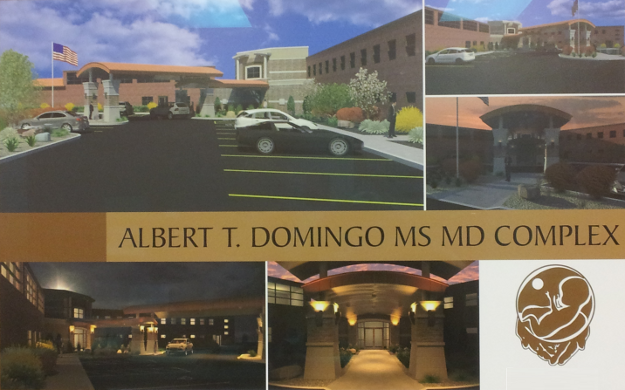 Dr. Domingo received the 2012 Adaptive Use Award for the extensive and wonderful conversion of the Hastings Armory into the Domingo Medical Complex Facility. The award is being presented by the Canton Preservation Society. The award is being presented May 17, 2012 at the Hartung House. Did you know that our office moved? We are now located at 3120 Parkway Street Northwest. Doctor Domingo is featured in MDNEWS discussing how Robotic Gyn Surgery Delivers Distinct Advantages. Doctor Domingo recently enjoyed participating in the first ever Dancing with the Docs fund-raising event, dancing the "Hip-Hop" with his daughter Miranda. Our office staff and guests celebrated the holiday with Dr. Domingo, his lovely wife Rosie, and their daughters Miranda, Ebony, and Brandi at our Holiday gathering Friday December 4, 2009 at Windsor Hall. We also had the privilege of celebrating with the Davinci Robotic Surgical Team from Mercy Medical Center. A great time was had by all. Santa stopped by to share some good cheer and presented the staff with "office and life survival tips"... you could hear the laughter from blocks away. Our providers were good sports as we embarrassed them with specially made by staff, reindeer antlers.... Thanks for allowing us to laugh with you! A lot of dancing, great food, and fellowship were had by all in attendance. Big thanks to all who came and celebrated with us... Here's to a great 2010!!!! Dr. Domingo has been in practice since 1989 in Canton, Ohio. He resides here with his wife of 33 years, Rosie, and has six daughters. Jessica is a graduate of St Mary's College, and received her Masters from University of Cincinnati, and works for a law firm in Cleveland doing immigration law. Stephanie is a graduate of Cornell University with a BS in Fashion Design Management and resides in New York City, Angela is a graduate of The Ohio State University BS, and is a clinical analyst in Columbus Ohio, Miranda is currently a Junior at The Ohio State University majoring in Communications, Ebony is a Freshman at The Ohio State University majoring in Nursing, and Brandi is a Senior at Central Catholic High School. They all are doing well. Dr. Ahn just celebrated his 40th wedding anniversary with his wife Sue. They have three daughters and one son. Ginna owns and operates a Sylvan Learning Center in Chicago. Jennifer is a physician at the University of Illinois Medical Center. Grace is an emergency physician in Chicago. Gerold is a teacher in Phoenix. Dr. Ahn enjoys traveling, playing golf, sports, and watching movies and shows. He has practiced in the Canton area for over 33 years.